While many of the trappings of Halloween are widely known, such as the witches, ghosts, skeletons, zombies and more, many of the holiday’s traditional roots are lost in the past. 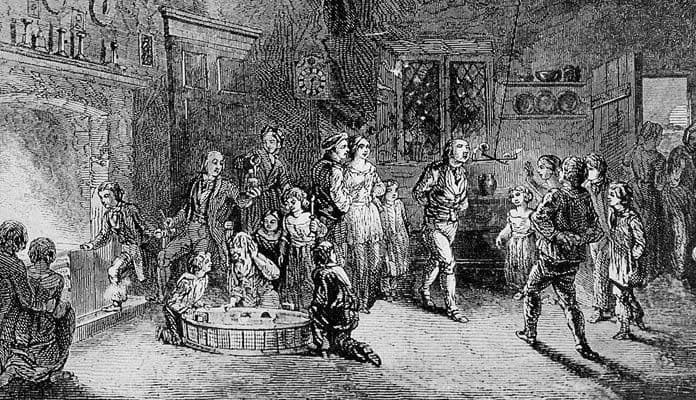 Halloween’s ties to Samhain, the Celtic harvest festival, are frequently forgotten. The incredible and lasting impact of Europe’s Christianization also had a significant role in shaping modern Halloween, down to its very name. Many modern facets of Halloween are also overlooked, including the role the candy industry has reportedly played in Daylight Savings Time, the vast sums of money Americans spend on costumes for their pets, and the false and trumped-up danger of strangers looking to give poisoned candy to trick-or-treaters. An illustration of English Halloween festivities. Wikimedia. The origins of Halloween lie in the Celtic festival of Samhain (pronounced SOW-win.) Samhain was a harvest festival that also marked the entry into the dark half of the year. At Samhain, the Celts believed the veil between the worlds of the dead and living were thinner than usual, and subsequently the dead could walk the earth. Bonfires and costumes marked the festival, with the former meant to ward off the dead while the latter were worn to confuse them. The modern religion of Wicca draws a great deal of inspiration from Celtic paganism. Samhain, being one of the chief festivals of Celtic paganism along with Beltain, plays a central role in the Wiccan faith. October 31st is one of the sabbats, or holy days, for Wiccans. Many Wiccans actually observe October 31st as their New Year celebration. For Wiccans, the October 31st sabbat or New Year is marked by celebrating the harvest, the changing of the seasons and everything that has been accomplished in the preceding year. The Wiccan “wheel of the year,” their calendar, also lists October 31st as the day their god dies, to be reborn on the winter solstice. Therefore, Wiccans also believe that the veil between life and death is thinnest on Halloween.